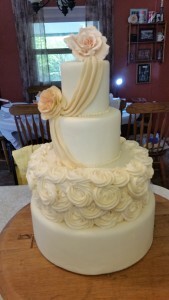 Maryann Potter, owner of Simply Beautiful Cakes, grew up in a country town in the pacific NW in Oregon. As early as High School age, she developed a deep desire to bake and decorate cakes. Taking beginning cake lessons soon turned into a life long passion for her. She began baking cakes and decorating cakes for friends and family and then for her own children. Maryann moved to Newberg, Or in 1997 with her husband and children and calls Newberg her home. 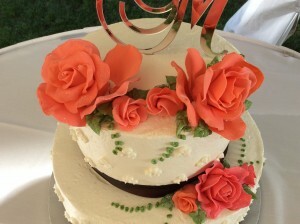 She put out the word quickly to friends and family that she does cakes out of her home and orders started coming in and continues to flow.learn more she kept taking classes along the way to learn new techniques and honing in on the ones already learned. This has been going on now for 40 years. Recently Maryann has started making her own sugar flowers for her cakes handmade and very special and specific for each cake. She loves to show off her artistry and talent by telling “your” story on a cake by creating and hand making the pieces that make it come alive and to make it truly “your” story. She uses her passion and skills and techniques to bring any cake to life and feels every cake is to be celebrated and embraced and seen as tradition. Because of this she has a saying “Live, Laugh and eat cake”. It only propels her to help the customer with their vision and to make their cake a one of a kind cake from simply simple to simply beautiful. 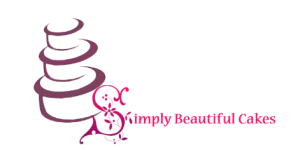 We at Simply Beautiful Cakes are excited to meet our next new clients treating each one very special as well as welcoming back our existing clients. Thank you Maryann! Everyone loved the cake and the decorations, especially the carrots and house. Will liked his cake too. Absolutely Beautiful! Our wedding cake is everything I thought it would be and more. You are amazing. You did a beautiful job the cake is lovely and we thank you for sharing your talent with us. Blessings on you!